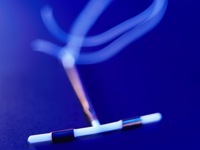 WEDNESDAY, May 23, 2012 (Health.com) — The small fraction of women who choose intrauterine devices (IUDs) or under-skin implants as their preferred method of birth control may be on to something: According to a new study, these long-acting forms of contraception are 20 times better at preventing unintended pregnancies than the Pill and other short-term methods. The difference in these so-called contraceptive failure rates was especially dramatic among teenagers and young women, a group at high risk for unintended pregnancies. Women under age 21 who used short-term birth control were nearly twice as likely as their older counterparts to become pregnant, whereas the failure rate for IUDs and implants was less than 1% regardless of age. "It's not that birth control pills aren't effective, because they are—when they're used perfectly," says Jeffery Peipert, M.D., a study author and professor of obstetrics and gynecology at Washington University Medical School, in St. Louis. "But humans aren't perfect, and it's normal to forget to take a pill every day or file for prescription refills every month." What's the Best Birth Control for You? Despite being far more effective than pills, IUDs and implants—collectively known as long-acting reversible contraception (LARC)—have proven to be less popular with women. According to the latest government data, just 5.5% of women on birth control use IUDs and less than 1% use implants. "When a woman tells her ob-gyn that she wants to go on birth control, most doctors offer the Pill right off the bat," Peipert says. "That needs to change. If there were a drug for cancer that was 20 times more effective, we would obviously recommend that first—and that's what we should be doing for contraception, as well." The CHOICE project, however, differs from real life in key ways that may shed light on why IUDs aren't more widely used. The project, which is funded in part by the Susan Thompson Buffett Foundation, was purposefully designed to remove all financial barriers to the use of IUDs and implants, which have a high upfront cost—$500 or more—and aren't always covered by insurance. All of the study participants, who ranged in age from 14 to 45, received a prescription for their preferred birth control method for two to three years, free of charge. With cost taken out of the equation, more than three-quarters of the participants opted for an IUD or implant—a proportion roughly 10 times higher than in the general population. IUDs, for instance, haven't fully shaken the bad reputation they earned in the 1970s, when an early device known as the Dalkon Shield was pulled from the market after it was found to cause infection and injury. Decades later, some gynecologists still aren't trained to insert IUDs, and others believe that many women—such as those who have never had children—are not good candidates for the method, Peipert says.